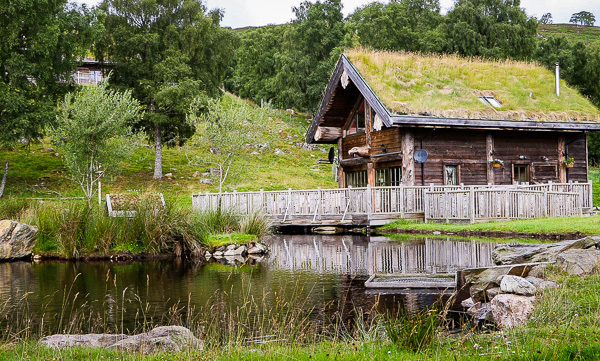 Nestled in the hillside of the beautiful Strathglass, a few miles outside Beauly near Inverness, lies Eagle Brae – a collection of luxurious log cabins available for holiday rental spread over the property on the Struy estate, owned and run by Mike and Pawana Spencer-Nairn. The term ‘cabin’ is doing them an injustice though. They are superbly pre-manufactured in British Columbia from huge whole logs, with added carved details internally and externally, before being shipped over and assembled on-site and then furnished very comfortably indeed. This includes many wonderfully intricate local artisanal fabrics and carved panels specially commissioned from Pawana’s home region of Himachal Pradesh in the Indian Himalayas. Each cabin has its own space around it and they are all set in a very natural environment surrounded by birds and visited by the local red deer on a daily basis who enjoy the lush grass around the cabins. The main lodge at Eagle Brae – you can just see my cabin peeking out between the trees above. 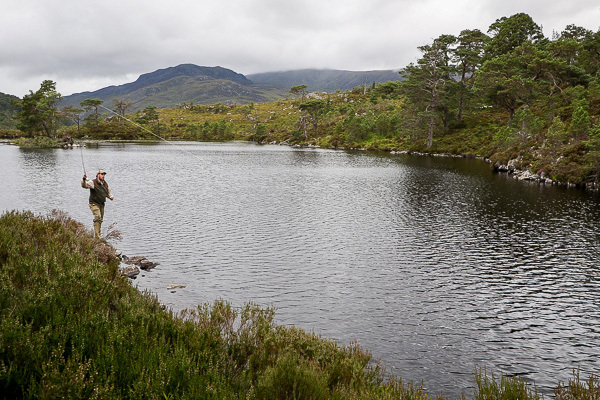 I had previously visited a couple of years ago for some late September salmon and done well on the nearby River Farrar but had yearned to try out the local brown trout fishing in their lochs. This visit was to be my chance as I was able to grab a quick couple of days stay on my way to a longer family sojourn further north in the western highlands. 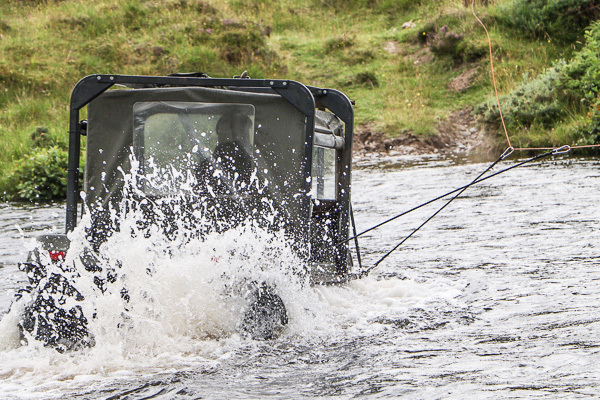 Placed in the large and capable hands of local man Greg Fraser, the Eagle Brae ghillie, gamekeeper and head stalker all rolled into one, we were to try our luck at two different lochs. Unfortunately our main goal of fishing Loch Monar, at the head of the stunning (and oh so Scottish) Glen Strathfarrar, was not to be thanks to the low water conditions there, but luckily the smaller Loch Beannacharan further down the Glen held more water due to the dam at it’s bottom end. And so clad in his favoured traditional Tweeds, Greg and I were on our way at last to see what we could find. Still conditions on Loch Beannacharan, not ideal when trying to fish loch style on the drift! Driving up the Glen past the Scots Pines and Silver Birch, flanked by rugged mountains on both sides, this is indeed Scotland at its best and arriving at the loch ready for a days fly fishing only made it even better. 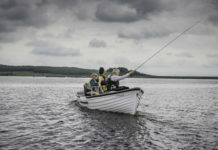 We motored up the loch to its top end, intending to try and drift down along the edges and managed a couple of decent drifts with the trout playing hard to get at first. Flies were changed, heads were scratched and the breeze dropped even further to compound our problems. A quick break for lunch on the shore and we were back on the water with a renewed vigour, returning to the head of the loch once more as Greg was convinced fish were there as he was only catching them just a few days earlier. A couple of missed takes at first and then finally I felt the lively pull of a wild brownie on the line. 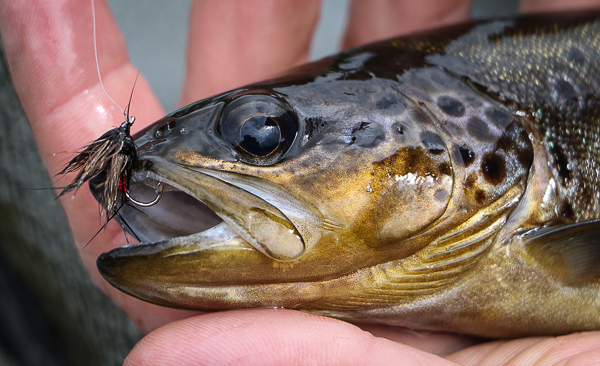 Success on the sedgehog at last, one of my go-to loch flies. It was a very dark but beautifully large-spotted fish and was returned safely to the loch after his photo call. 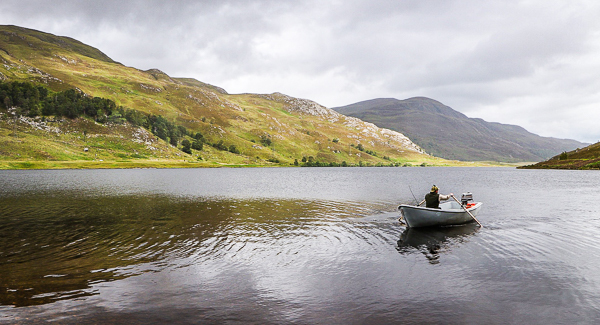 A hard-won brown trout from Loch Beannacharan. 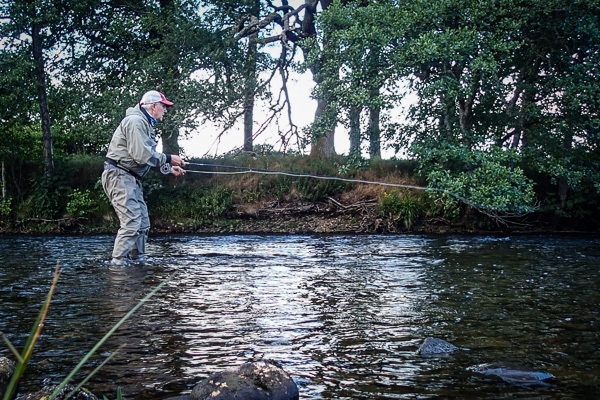 There are plenty of brown trout in both the River’s Glass and Farrar on the Struy estate land that can be targeted as well as those that dwell in the lochs. 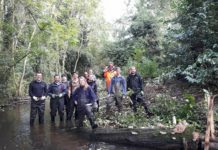 Those in the slowly meandering Glass, that cuts its way down through the fields and floodplain of Strathglass tend to be bigger and fewer, whereas those in the wild and rushing Farrar are smaller on the whole but much more plentiful and free rising. I had some extra time to play with so headed for the Farrar just downstream of the road bridge at Struy village to see if I could winkle out a river trout as well. 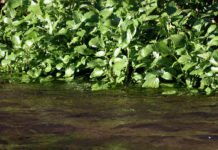 The author slowly working his way downstream, fishing the run under the trees for wild brown trout on the Farrar. Initially all was quiet, despite the deeper run down under the trees on the far bank looking very inviting. Fly was coming off but no rises were evident so the locals had obviously not woken up yet. As the evening wore on sure enough some action started to happen, particularly in the shallow glide just upstream of the road bridge where a salmon also leapt with a splash from his hole, and it was not long before I was into several small, but beautifully marked trout that eagerly rose to the dry fly. A very different looking fish from its loch-bound cousins. A lovely mix of dark and red spots over a buttery bronze flank. My final day’s adventure saw me back with Greg once more, but this time heading up into the hills via an extreme Argocat ride that first had us fording a higher than normal River Farrar, before ascending at impossibly steep angles at times whilst bouncing over rocks and heather whilst I hung on for dear life. Finally arriving at a small, remote, un-named lochan that is stocked with fish from the river now and then, we piled into the small boat that is kept up there that two can just about squeeze into and headed out into the loch. Being located in a hollow and surrounded with mature Scots Pines on all sides, it was very quiet and peaceful and the perfect place to be out on the water. We were even visited by a wandering Osprey for a short while, an omen surely!? And it was. Soon after I struck into a fish that proceed to exit the water like a mini Polaris missile, straight up about 2 feet in the air. 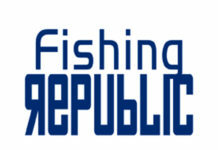 Greg explained that the loch is not over-stocked and so the fish that are there feed very well on the available food and are not often bothered by fly anglers as it is very lightly fished – I was honoured. The fish was a real down-deep battler after that, putting a healthy bend in my rod, and I was convinced I had a 2lb+ fish on the line (which come out of the loch now and then I was told) so was amazed to find it was not that big when it came to the net. Another dark and large-spotted fish similar to those in Beannacharan and very welcome indeed. This trout fought like one twice its size. Being just a small loch, the drifts were only short but with a light breeze and overcast, conditions were just about perfect really. Passing my rod to Greg he had some casts from the boat and then from shore also as we had seen and caught a couple of fish hard along the shoreline. We managed a few more of the battling browns between us before and after lunch before figuring it was time for the bone-jarring return journey back down the hill and home for the day. 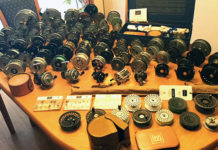 Ghillie Greg Fraser casts his line up at the hill loch. Another handsome brown trout from the un-named lochan on the hill. 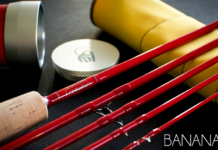 Aside from the trout fishing, Eagle Brae offers salmon fishing in season as well as the chance for a pike in the River Glass. It also plays host to many other activities in the surrounding area such as hiking, horse riding, stalking, photo-safaris, dog-sledding, golf and canoeing. There is even the chance to visit a Black Grouse lek on estate land in the Autumn months to watch this superb natural spectacle. 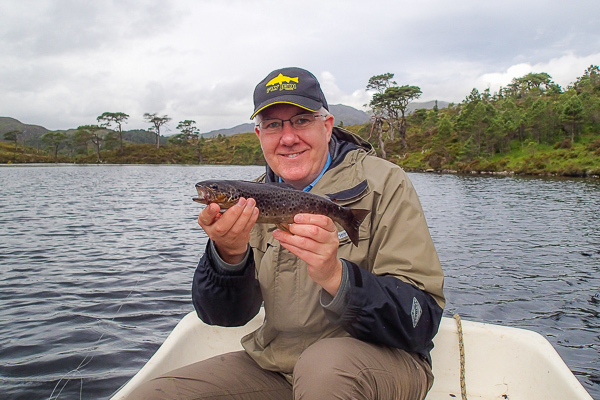 It is the welcome and the hospitality as much as the fishing that will draw me back to Eagle Brae once more though, and I will get to fish Loch Monar – eventually! 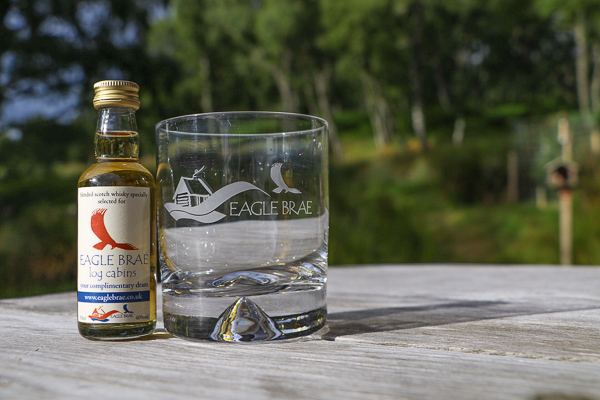 You can be sure of a warm welcome at Eagle Brae with their own whisky included in a well-stocked basket of local goodies on your arrival.